The Woodstock VT area including the towns of Woodstock, Barnard, Pomfret, Hartland, South Woodstock, West Windsor, Bridgewater and Reading are home to many of Vermont's finest properties and estates. 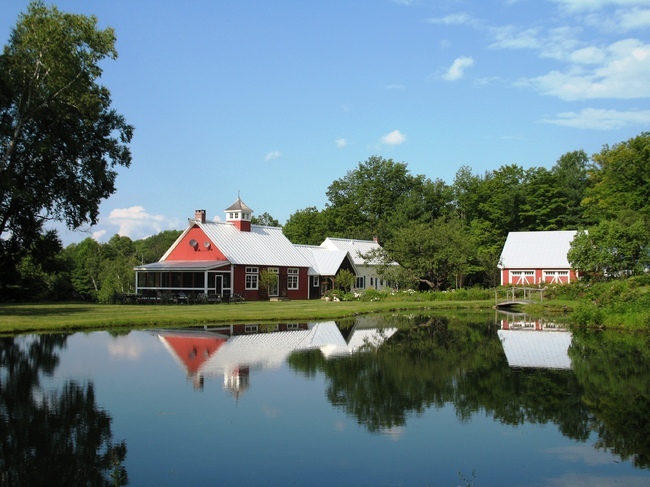 The area hosts privately situated VT second homes with long-range mountain views, pastoral settings overlooking ponds and gardens, and "gentlemans" horse farms. See more at www.atwoodplacevermont.com ATWOOD PLACE- This elegant, historic Vermont farm residence is privately situated on 163 acres. It is an ideal location just 7 miles north of Woodstock Village. The main residence has been beautifully updated and maintained with a gourmet kitchen, antique historic period details, 5 fireplaces, formal dining, living room, den/library, workout room, 4 bedrooms, and 2 1/2 baths. There are acres of pastures/fields, mowed lawns, manicured gardens and flower beds bordering the road lined with handsome stone walls. Apple and birch trees abound. The spectacular stone-lined swimming pond has a nearby outdoor entertaining space with stone patio, outdoor fireplace, and a gazebo for dining. The tremendous Atwood Brook courses through the property behind the house. There is a circa 1850 barn-shed across the road. Further down the quiet Wayside Road is a newer, larger barn with 2 separate apartments and a workshop/studio space. Atwood Place is also only minutes to Silver Lake in Barnard, and has easy access to the best of the Upper Valley Region of Vermont & New Hampshire, including Hanover / Dartmouth College. 1018 Deerbrook Way - SOLD/CLOSED AT $1,500,000 - offers the perfect Vermont getaway with end-of-road privacy on 26 +/- acres, a FABULOUS long-range mountain view overlooking the swimming pond, and a beautifully constructed and well-maintained getaway residence. Constructed in 2009 with substantial recent upgrades including kitchen renovation, upgraded insulation, Hunter Douglas window treatments, new generator and more. All the amenities you are seeking in a second home - including an open floor plan, gourmet kitchen that opens to a vaulted ceiling great room with stone fireplace and exceptional views! Two pairs of french doors open from the great room out to the expansive south and west facing wrap-around deck that looks out over the pond to the long-range mountain views. First level master bedroom, three other bedrooms, three full baths and one half bath. The downstairs was recently fully renovated into a hang-out den/rec/TV/game room plus other spaces for workout equipment, and painting/writing studios/office space. Mechanicals include a two-car attached, heated garage, whole-house UNICO AC/heating system, full automatic backup generator and high-speed fiber optic internet - so you can get away but be fully wired when required. The property is located at the top/end of a private road and is just 15 minutes to Killington and 8 minutes to the Woodstock Green - so very easy access. 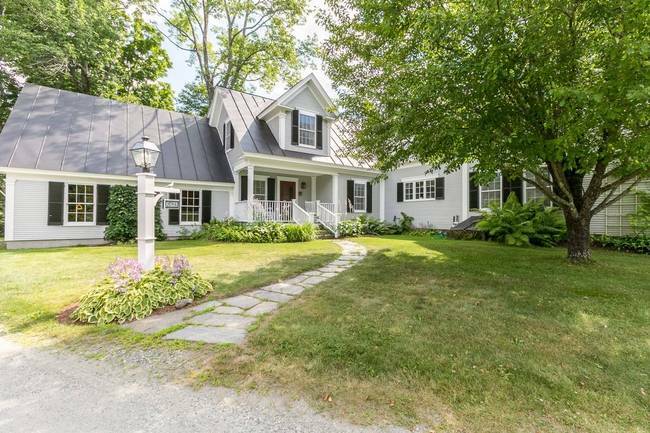 This house is quite simply the perfect turnkey Vermont getaway house that has it all! Beautifully finished, custom-built home, guest apartment, multiple outbuildings and garages - large pond, exceptional long-range mountain views and easy access to the Village of Woodstock. Main residence boasts large eat-in kitchen with island, custom built brick pizza oven fireplace, Wolf Range, lots of light and great views of the pond and grounds. First floor master bed with ensuite bath and his/hers walk in closets. Lovely screened in porch overlooking view and pond. 1,700 sq ft guest apartment over the 3 bay garage, with an additional detached 3 bay workshop. Total heated garage space for 6 vehicles. Landscaped grounds with perennials, fruit trees, stone walls and white birch that lead to the pond. Beautifully maintained home, big views, and private pond located close to Woodstock in an area of other substantial homes in the Gold Coast/Grandma Ams Hill/Atwood Lane area of North Bridgewater. Listed (Sold) June 2017 by John Snyder of Snyder Donegan Real Estate Group. Enjoy pristine long range south easterly views from this splendid, well appointed, light filled post and beam contemporary. 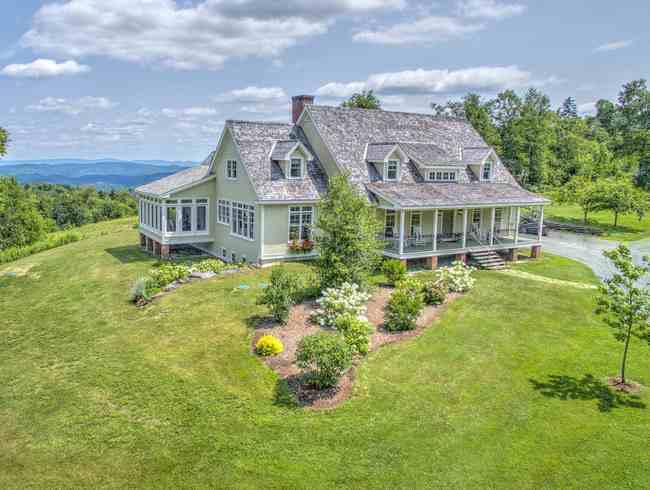 The 55 acre parcel is comprised of gently rolling lawn, fields, an orchard, a manicured trail system and a four season brook wandering through an impressive inventory of native hardwoods with restored antique stone walls that lace throughout. The magnificent stone terraced perennial gardens offer an ever-changing palate throughout the seasons. Plenty of room to entertain family and guests in the finished walk out lower level. The spacious well-built barn is situated perfectly to accommodate horses, toys or hobbies. Enrolled in VT Current Use Program.This extraordinary property offers tranquility and total privacy, but only 14 minutes to the Woodstock Green, and 5 minutes to Silver Lake. Close proximity to several ski mountains, Upper Valley, Hanover, NH and I-91.